When you log on to the live webcams and see your precious dog having a fun time playing with other dogs and getting loved on by our staff, your mind can be put at ease. After you have confirmation from seeing your dog, and you know that he/she is okay and happy, it is much easier for you to focus on your day and be productive, enjoy your vacation or enjoy whatever you may be doing. Happy Pets Palace shares viewing on our live stream webcams with everyone because we understand that need to know, that confirmation of seeing is believing, and the reassurance and trust it brings. We want our customers to enjoy their vacations. Removing any worry about your dog helps you to have a better day. When you know your dog is well cared for, and you check up on them via the live webcams, any worry is replaced with peace and happiness. For most of our clients, our dogs are a large part of our personal identity. When we are away from them there is a void in our heart accompanied with some sadness. That feeling is natural. Even though the heart is only as big as a closed fist, our love for our dogs is infinite, bigger than the universe. They complete our family. So, seeing our dog on camera helps us connect with the joy they bring to our life. Seeing them happy fills our hearts with gladness. New clients can be a bit obsessed with watching the dogs play. We have heard people say that our live webcams should be a reality dog t.v. show because watching them goof off is so entertaining. We have people who watch our webcams when their dogs aren’t even at our facility because the dogs can be hilarious. School teachers have used our camera viewing as a reward for their students to finish their assignments faster, so they can watch the dogs play on the classroom monitor. Clients love to show their family and friends their dog(s) on the live webcams. And watching the dogs on your phone helps make your wait time in any line, especially at Disneyland, go by much faster. Clients enjoy seeing their dog interact with other dogs. They get to know the regulars and who their dog plays with most often. Just like children may behave differently when their parents are not around, dogs do too. People are surprised to see their dog do things which they don’t expect, such as enjoying getting wet in our above ground splash pools or seeing them climb on the playground equipment. Parents of senior citizen dogs are always blessed to see their dogs get rejuvenated and act like a young dog again. Those moments are priceless. We offer an opportunity for you to see how your dog behaves when you are not by his/her side. Many people only have one dog so dog-dog group play in a safe environment is fun to watch. And because it is so fun, it is quite addicting. Happy Pets Palace employees know that the live webcams are viewed constantly throughout the day. We tell our employees their role interacting with the dogs is a huge part of the customer service we offer. Loving on the dogs and overseeing their interactions with other dogs is a service we provide to all dogs in our care. And with technology that customer service (given to your dog) goes through the internet and is viewed via your smart phone. You can see our terrific team caring for your dog making their stay with us more comfortable and enjoyable. Ours is a very rewarding job. We get to know these dogs well and we love them! There are rewind capabilities called Remote Playback available on our app to replay video footage. It can be helpful to identify any sequence of events and viewing in slow motion. We can see which dogs and employees were in the yards and anything that occurred. Replayed footage can serve as a learning tool because we can narrate a play-by-play of events to staff and/or clients. When dogs are eating breakfast, lunch, or dinner, they are in their family private villas. We do not have cameras in each villa. However, we do offer one boarding villa with a camera 24/7 which is our Royal Chambers Suite. It is our largest accommodation, 8-ft x 8 ½-ft, and does cost an extra $25/night. If viewing your pup 24/7 is extremely important to you, or if you prefer or need the largest overnight boarding accommodation, then we do have one suite available. Advance reservations are required. We are happy when you check up on your dogs. We provide the live stream cameras for you to have peace of mind and enjoyment watching your dog, or any dogs, playing. It’s fun! And that makes us happy! You may see us waving to the cameras every now and then, or holding a small dog or puppy and having them wave to the camera. Know that we are giggling when we do this. We love our job! We create these moments knowing you may be watching. We hope you enjoy those moments too. 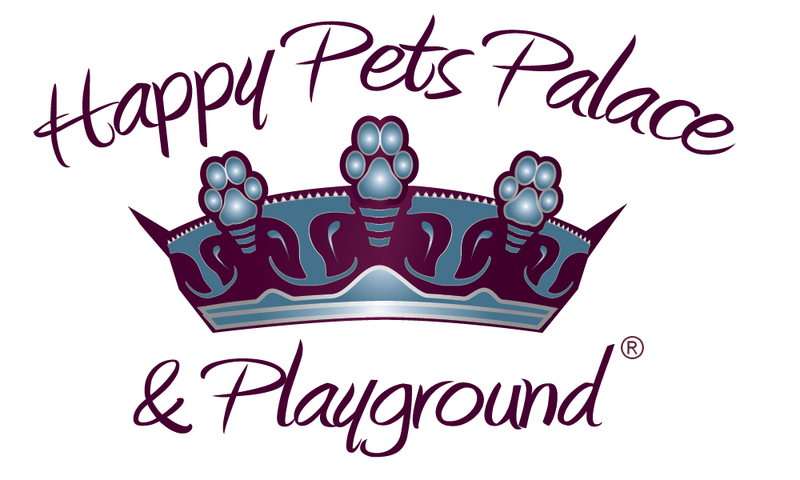 And we hope you are entertained and have a sense of reassurance of the fun that we have at Happy Pets Palace. HOW TO DOWNLOAD THE APP – You can download the app to view our live stream webcams by following the instructions here. We would also be happy to set up your smart phone for you if you bring it into our lobby.